Leaders of the Group of Seven wealthy nations met African heads of state on Saturday, the final day of their annual summit which has been marked by discord over climate change, but unity on tackling terrorism. President Donald Trump told his G7 counterparts from Britain, Canada, France, Germany, Italy and Japan on Friday that he had not yet decided whether to honor a landmark 2015 Paris accord on curbing carbon emissions. European leaders have expressed frustration in private at having to go back over an issue that they believed had been signed and sealed two years ago. There was also continued friction over global trade, with Trump, who got elected promising to put America first, blaming multilateral commerce deals for U.S. trade deficits and demanding what he terms a “level playing field”. 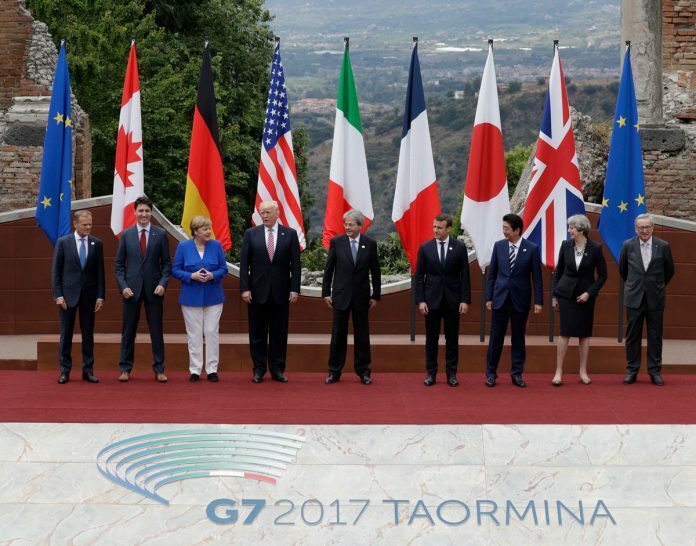 However, the G7 leaders said there was broad agreement on an array of fraught foreign policy questions, including on Syria, Libya and North Korea. They also vowed to increase efforts to counter extremism after an Islamist militant suicide bomber killed 22 at a concert in northern England on Monday, and told internet service providers and social media companies to “substantially increase” their efforts to rein in extremist content. “The threat of terror is one that all our countries face and now more than ever we must strengthen our resolve to overcome this threat,” said British Prime Minister Theresa May, who skipped the Saturday talks and returned home a day early because of the Manchester attack. Italy hosted the G7 meeting in Sicily to draw attention to Africa and the plight of migrants who are risking their lives in ever greater numbers to make the perilous crossing of the Mediterranean in search of a better life in Europe. More than half a million have landed in Italy since 2014, with 1,400 brought ashore by rescuers on Friday alone. The leaders of Tunisia, Kenya, Ethiopia, Niger and Nigeria will join the discussions on Saturday morning, with Italy keen for the world’s wealthiest nations to help the continent develop its economy in an effort to persuade young Africans to stay home. However, Italian proposals to highlight the positive impact of migration and to promote a major initiative on food security were both shot down in pre-summit talks, with the Trump administration unwilling to play up any benefits of human mobility, a diplomat said. The leaders are expected to issue a vastly shorter communique than in previous years, with one European diplomat suggesting it might be just six pages long compared to 32 last year. Diplomats worked late into the night to try to agree the wording with the United States on global trade. There appeared to be little expectation of any overnight breakthrough on climate change, meaning Washington’s G7 allies might take the unusual step of issuing a statement just in their own names to stress their continued support for the Paris deal. Despite the impasse, Trump’s economic adviser Gary Cohn said the president’s views on climate were developing. “He came here to learn. He came here to get smart. His views are evolving which exactly as they should be,” he said on Friday, adding that Trump would ultimately do what was best for the United States. There was broad agreement on an array of fraught foreign policy questions, including on Syria, Libya and North Korea during the G7 Leaders Summit 2017.